Pole buildings were originally designed in the 1930s and used round utility poles to create horse barns and agricultural buildings in a simple and inexpensive way. Over time, utility poles were substituted with laminated beams for even more ease with construction. If you require an inexpensive way to store agricultural equipment or need some additional farm animal housing, pole building plans are a great option with plenty of flexibility. 6720 Sq. Ft., Width 72'-0", Depth 60'-0"
880 Sq. Ft., Width 40'-0", Depth 22'-0"
2240 Sq. 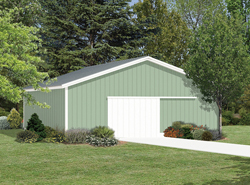 Ft., Width 56'-0", Depth 52'-0"
Our collection of pole building plans includes many sizes perfect for your storage needs. We offer easy-to-follow blueprints that makes building this project simple and easy. With a wide variety of plans, we are sure that you will find the perfect do-it-yourself project to fit your needs and style.